For a team that has spent most of the year treading water and trying to get back to the .500 mark after a terrible stretch at the end of April, the wheels have completely fallen off. The Twins have now lost four games in a row, and 9 of 11 overall. If the team wasn’t in sell mode before as they have fallen a full 10 games back of the Indians in the division standings, they should be now. We had a good run without having to deal with the Fernando Rodney Experience, but just as soon as it left, it was back again. Rodney has now blown back-to-back save chances, and in both instances, he had to work out of a jam just to get the game to extras. However, this time Rodney didn’t get bailed out as Zach Littell gave up the winning run in the bottom of the 10th on a four-pitch bases-loaded walk. It wasn’t the sharpest of outings for Kyle Gibson on the mound. The first inning got off to a shaky start, but he was able to get out of it with just one run allowed when Jesus Aguilar was thrown out at home by Eddie Rosario after Joe Mauer threw the ball into left-field and it was overrun by Eddie Rosario. Gibson gave up three more runs in the fifth (two earned), after allowing a leadoff home run and a slew of hits. He had a chance to get out of the inning with just two runs allowed, but Willians Astudillo booted a routine grounder at third that would have ended the inning. Gibson had a much better night at the plate, however, as he went 2-for-2, doubling his career hit total. The Twins were primed for a big inning in the third, when they had runners on the corners and nobody out. However, they settled for just one run even after Brian Dozier was given extra life after he appeared to have struck out. Robbie Grossman hit his first career grand slam in the fifth inning, coming with two outs in the inning. In the top of the seventh, Joe Mauer was robbed of a home run by Keon Broxton. This run turned out to be huge later in the game. CHC 10, MIN 6: Hey, Remember Joe Mauer? Also posted this in the game thread: In the classic save situation of a one-run lead to start the ninth, Rodney is now only 1 out of 4 in converting those to wins. Rodney has been pretty good for two months, he's one of our last things to worry about. I really hope this is the last time we need to worry about him since he should be traded soon. Thank God for no more Rodney experience. They should trade him soon, but the angst over Rodney is overblown. That 5th inning blew. Bad error at third let in a run but anyone else think that challenged play should have been overturned and it shouldn't have gotten to that error in the first place?. Why do they even bother with the replays when they only get 50% of them right anyway? Sometimes I think they should be able to challenge a challenge and get them to look at more angles. Rodney should be a set up guy period. He has better stuff than Reed. He is just not a real closer anymore. He should not be trusted to close when there is only a one-run lead. I get the result of this game stunk. And yes, Rodney did blow the save. But he HAS been largely good for some time now. Littell may have a quality future in MLB. I hope he does. And I'm not excusing a closer who has done a really good job until tonight, but Littell pitched scared tonight. Really, there was nobly else to throw tonight? Couldn't keep Busentiz over Belisle? Couldn't promote a single RP from Rochester who could bring it and throw a strike? Not piling on. Just frustrated as can be! I get the result of this game stunk. And yes, Rodney did blow the save. But he HAS been largely good for some time now. Littell may have a quality future in MLB. I hope he does. And I'm not excusing a closer who has done a really good job until tonight, but Littell pitched scared tonight. Really, there was nobly else to throw tonight? Couldn't keep Busentiz over Belisle? Couldn't promote a single RP from Rochester who could bring it and throw a strike? Not piling on. Just frustrated as can be! I hear you, brother. This was a management cluster all around. Rodney does have consecutive blown saves. You've got 4 or 5 guys (if May is included) who would love to get a shot at high lev situations in Rochester. Time to move Rodney before his value implodes. Good and lucky are two different things. Trade value is as high now as it will get. We will see if any other team is fooled. Time to move Rodney before his value implodes. Not sure any contenders want to deal with Rodney, looks like his value has pretty much already imploded. The Twins need to sell, and just about every asset we'd like to sell is at an all-time low, unfortunately! Can the guys just win a damn game, pleeeeezzze? After the heat of Chicago it would have been a good time to bring up good arms from the minors - not starting pitchers, but relief pitchers.And enough with Belisle.The only value he brings is to be old enough to give Rodney someone to talk to. Its a matter of value. No one is going to value him as a closer. But he's not a bad third reliever for a good team. I wouldn't say overblown, I'd say he deserves his equal share of credit for turning this season to junk. Early on, and now again he is taking the stage. He is pulling his weight. Of actual closers he has one of the worst or worst save percentage. Rodney is what he is, a veteran closer that is fairly consistent but not great. If Rodney is not traded this was a terrible free agent signing, it is that simple. It has been a long time since Rodney has had setup experience. If I were an acquiring team, I would be a little worried about how he'd adjust to the role. There are enough relievers on the market that he probably wouldn't be my top priority. Classic Gibby in the 5th inning also.Given a grand slam then comes back and nibbles at the strike zone, then gets hit around.5 innings, 8 hits 2 walks. Agree though wasn't helped by the 3rd Baseman Catcher. If they sell (as I believe prudent) who the closer is, doesn’t really matter, as they won’t be getting any saves anyways. Rodney should stay the closer, he can tune up the bullpen car, maybe jazz it up with some cool decals. Time to get triple A guys some middle relief experience. My vote is Gonsalves should replace Belisle right away. 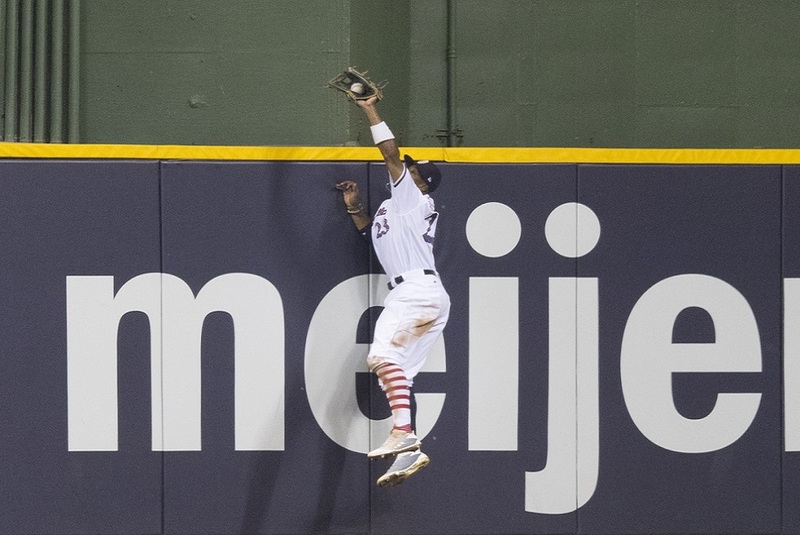 Well, plenty of ifs and maybes in that game, but that great catch by Broxton, robbing Mauer of a homer, really really hurt! Littell optioned to AAA according to Berardino. Looking at the stats online the Twins have a total of 18 blown saves collectively as a team.This matches Detroit at 18 followed by KC and CWS at 11 and CLE at 10.Would be nice to know how many BS turned into loses and what everyones record would be if they converted all BS into wins. This has been one of the most frustrating seasons I can remember. Not really because they haven't been doing well (part of the reason, but not the whole story for me), but because this is one of the most physically talented and gifted (core) groups of players I've seen in in quite some time. When I match that talent with on field production... well, it's disheartening to say the least. It is not that he failed again that bothers me, it is the Twins way of bringing up young players, throw them in for one or two games and then send them out.No adjustment, no easing them in.How do they build confidence.Oh great I am called up and I have 2 at bats or one performance and I am gone! In those good old days they would bring up pitchers, let them have a few non-pressure relief appearances and a start against a lower rung team.Now Mejia gets the Cubs and Littell gets the Brewers in an extra innings game. No they did not do well, but what did we do to let them have success?The FO continues to frustrate me.And I will admit that Molitor is not Casey Stengel, but he works with what he is given. 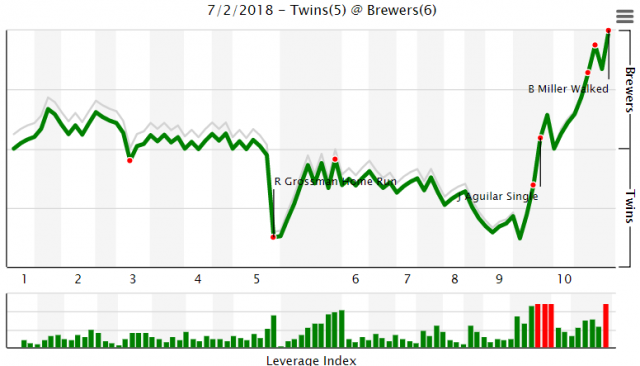 I mentioned in the game thread last night that I could see an intensity from the Brewers that appears to be lacking for the Twins. And, contrast Molitor pulling Gibson for a pinch hitter last night versus Maddon leaving Lester in the night before. Molitor is a typical old-school manager who keeps trying the same thing over and over expecting a different result. One year we had Brian Harper, Greg Gagne, Kent Hrbek, Gary Gaetti, Shane Mack, Dan Gladden, Kirby Puckett, Gene Larkin, Rick Aguilara, Juan Beurenguer, Kevin Tapani, Scott Erickson, Dave West and Allen Anderson. And took last place and finished 29 games out of 1st. I'm not saying this team will rebound next year and win the WS like that team did but I am pretty sure if there was Twins Daily back in the day there are plenty of fans that would have wrote what you did. I am very disappointed with the way this year has gone so far but where people say "wait til next year" and consider it a negative thing I say "wait til next year" because that might be the year it all comes together.I agree that there is talent there.Last year they may have over performed a bit but this year it has all just gone wrong. I totally agree. Sometimes a team is just... snake bit, and the season goes south. For me, it is that imperfection of baseball that keeps me enthralled even through the years like this .